One of the most common over-use injuries is pain in the knee when running. Some even affectionately refer to this pain as Runner’s Knee. Research shows that runners tend to have a higher incidence and severity of arthritis in their knees, which makes sense. What the studies also show, however, is that runners have a lower levels of pain than their sedentary cohorts. How can this be? 1. Weak quadriceps. While you may think that running is enough work to keep your quads strong, the quads can become relatively weak compared to the hamstrings. The hamstrings are responsible for slowing down the leg during the swing phase. As your leg gets to the end of the swing phase of running, your hamstrings are working really hard to get ready to stop the leg from swinging forward and getting ready to land and eventually propel forward. This imbalance can cause pain in the knee when running. 2. Tight hamstrings. With the continual activity of the hamstring muscles, it’s not surprising that they become tight. Add to it that most of us spend too much time sitting during the day which only worsens the tightness issue. Tightness in the hamstrings works against the quadriceps, just like a weight machine makes it more difficult to move your arms. This makes your quad muscles less effective at protecting your knee. 3. Weak glutes. Without good control of the hip through the glute muscles, you are putting more stress on the back, hips, knees and ankles. If the glutes are weak for example, your knee will tend to move toward the other knee, creating an abnormal stress to the knee. 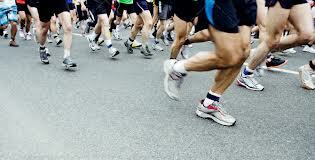 The reason why runners tend to have lower levels of knee pain than their sedentary peers is that joints like movement. The knee joint is a synovial joint. With every step fluid is released into the joint, lubricating the joint like oil lubricates a hinge. Uncontrolled motion or abnormal stresses make the knee work in a way that is not what it is designed to do, thus causing pain in the knee when running. If you or someone you love suffers from pain in the knee when running, call us to speak to a physical therapist who is well versed in running injury solutions.